Anyone who knows me knows that when I go on vacation, I check out at least one beauty treatment. I simply can't go to another city without seeing what they have to offer in the ways of massages, facials, nails, hair and all the rest. So, of course, I simply had to indulge in the Ritz-Carlton Signature Massage at the Ritz-Carlton Los Angeles during my trip this past week. 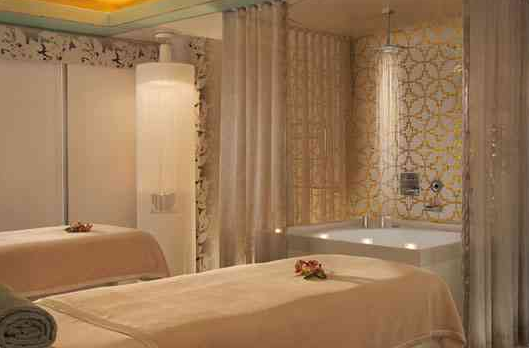 Walk into the spa and immediately be whisked away to an oasis in the middle of downtown Los Angeles. The locker room is so decadent, replete with bed-like lounge chairs in both the lounge area and the huge steam room! And the coed lounge area outside the locker room has a make-your-own granola bar, berry water, more bed-like lounge chairs and even cashmere blankets. The Ritz-Carlton Signature Massage at the Ritz-Carlton Los Angeles is $135 for 50 minutes and $195 for 80 minutes. For more information on this service and the rest of the luxurious services offered at the spa, visit ritzcarlton.com.